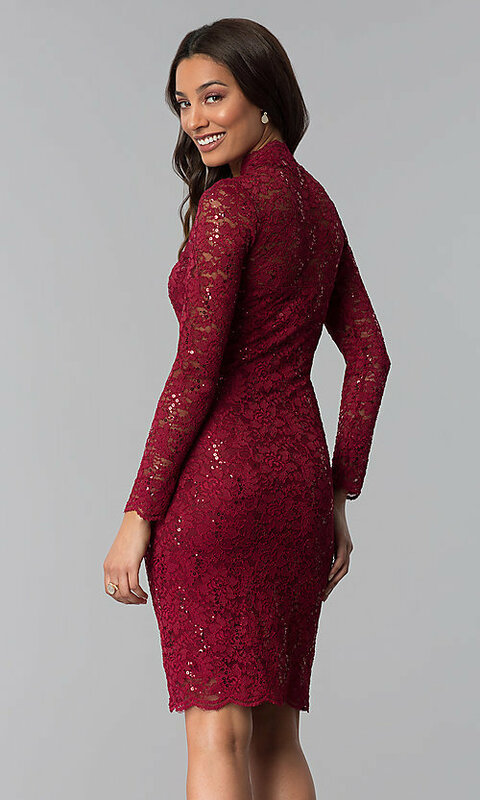 Elegantly edgy, this knee-length lace wedding-guest party dress combines sophisticated style with trendy details. From the modest high v-neckline to the scallop-trimmed knee-length hem, this semi-formal lace dress is sprinkled with shimmering sequins for just the right amount of sparkle. Long sheer-lace sleeves keep you comfortable in cooler venues, while a soft strapless jersey lining provides necessary coverage to the short party dress. Priced under $100, this knee-length lace wedding-guest dress is ideal for any semi-formal event. 37", Hollow to Hem 36"